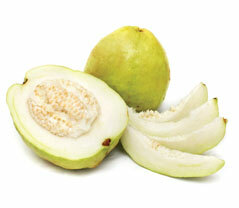 Fresh Guava fruits are ripened, sorted, washed, and sliced. Seeds and grit are removed manually, they are dipped in chlorinated water, and then diced through FAM dicer. The dice is fed through dewatering and in feed shaker to Individual Quick Freezing. The IQF Dice is then sieved, inspected, weighed, and packed. The packed cartons are fed through a metal detector and transferred to the cold store at -18° C. The entire process is carried out under strictly hygienic conditions.